While Europe comprises nations with diverse policies and goals, the desire within the education sector to increase international mobility among students is a widely shared objective. A recent study written by Bernd Wächter and Friedhelm Maiworm published by the Academic Cooperation Association (ACA) collected survey data from European education institutions to examine their use of programmes taught in English as a tool to increase mobility. Data collected by ACA in collaboration with the Gesellschaft für Empirische Studien (GES) and StudyPortals BV shows that the number of English-taught bachelor and master programmes – referred to in the study as English-Taught Programmes (ETPs) in non-English-speaking European countries has more than tripled over the last seven years. Comparing data from earlier studies shows how widespread the adoption of ETPs has become. The number of English-taught programmes was counted as 725 in 2001, 2,389 in 2007, and according to the present study, 8,089 in 2014. The new data, as well as that from other sources – such as that included in a 2013 ICEF Monitor article – attests to the accelerated introduction and delivery of ETPs across Europe. Currently, Germany has the largest number of institutions offering such programmes, at 154, followed by France with 113, and Poland at 59. 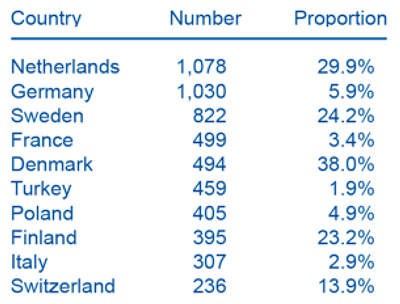 In absolute terms, the Netherlands has the most ETPs with 1,078, followed by Germany with 1,030, and Sweden with 822. The chart below shows the top ten countries for ETPs numerically, and the proportion within the total number of programmes available. Because the number of higher education institutions per country differs, the percentages offer more revealing data. Denmark, Netherlands, Finland, and Sweden offer the highest percentage of courses in English, whereas by proportion, France ranks below sixteen other European nations in offering ETPs and Germany ranks below fourteen other countries. In general, eastern and southern European countries offer the fewest ETPs by both number and percentage, with Greece, Croatia, and Bulgaria offering the least in sheer numbers, and those three countries along with Romania, Italy, and Turkey offering the least by percentage. The chart above hints that ETPs are strong in the Nordic region, and the ACA’s data bears that out. Almost 61% of institutions in the Nordic countries offer bachelor and/or master programmes completely taught in English – nearly 20% of all programmes there fall into that category – and more than 5% of all students are enrolled in ETPs. The chart below divides Europe into six areas to provide a snapshot of how such courses are distributed regionally. As the chart suggests, despite remarkable growth in the number of ETPs during the last decade, the percentage of students enrolled in such courses remains small. For Europe as a whole it stands at 1.3%, which amounts to about 290,000 participants across the continent for 2013/14. ACA tracked the student mix in these courses, and found that 54% of the total were foreign students in the nations in which they are studying. In the 2007 survey that percentage was much higher, at 65%, and in the 2002 survey the percentage was 60%. The reasons behind this 11% drop in foreign enrolment over the seven years is not entirely clear, but could be a reflection of economic factors in Europe. However, there is still international diversity in the programmes. As few as 5% of the ETPs surveyed reported only domestic students enrolled. At the opposite end, 10% of ETPs stated that all the students were from outside their own country. Comparatively speaking, ETPs in the Baltics and in Southeast Europe tend to enrol domestic students, while those in the Nordic region and Central West Europe enrol more foreign students. The 14% Asian grouping is composed of 4% from China, 4% from India, and 6% from the many other countries in the region. The survey also tracked English language proficiency, and a large majority of ETP directors rated their students as good or very good in this area. Domestic students fared better in these assessments than foreign students, and students in social sciences, business, and law fared better than those in engineering, manufacturing, construction, and hard sciences. On the negative side, heterogeneity – that is, variation in command of English – was viewed as a problem in classrooms. Some coordinators also reported other problems related to heterogeneity such as the differing expectations of students with regard to teaching methods. For example, expectation for more passive versus more interactive approaches, differing levels of subject area knowledge, and differing student academic practices and ethics. To compensate for shortages at the institution – i.e., to counterbalance a lack of enrolment by domestic students and/or to generate revenue from tuition paid by foreign students. The survey notes that in general, revenue as a motive was cited least often, whereas altruistic considerations – for example in the area of development cooperation – played a surprisingly strong role. Language proficiency issues – low levels of English among teaching staff and/or among domestic students; or, on the other hand, high proficiency of foreign students in the domestic language. Type of higher education institution and/or discipline – English was deemed unnecessary, difficult to introduce, or incompatible with the discipline taught, for example music or the arts. Conversely, some institutions offer programmes with specialised terminology students needed to master in the domestic language, as is the case in teacher training or law. Insufficient international enrolment and/or lack of interest among foreign students. Contractual considerations – some institutions have established bilateral agreements with foreign institutions stipulating that incoming students master the domestic language. Legal obstacles, for example arising from regional autonomy agreements, such as in Spain, which create difficulties designing study programmes; accreditation issues also exist in some countries, such as the Czech Republic, Hungary, Romania, Slovakia and Slovenia. Resources often relate to the size of an institution. Larger institutions have the ability to offer more programmes of all kinds than smaller ones, and are statistically more likely to offer programmes taught in English. The survey showed that in 2013/14, only 14% of institutions with 500 students or fewer offered ETPs, while 52% of institutions with 2,501 to 5,000 students offered them, and 81% of institutions with more than 10,000 students administered such programmes. The improvement of assistance/guidance/advice for foreign students (71%), including the provision of information and services in English. When asked in detail about the benefits to students, programme directors cited career benefits. Improved mastery of English in itself, apart from degrees earned, was believed to be a strong aid to future employment prospects. Respondents also cited as positives such as better networking opportunities thanks to a multinational student body, good preparation for international employment, and more mobility opportunities. Interestingly, many programme directors also believed that one strong benefit of ETPs was the closer interaction with teachers made possible by the generally smaller class sizes. Under such conditions, they believed students received more personalised guidance, which in turn enhanced the overall quality of their education. As a result of adopting ETPs, 56% of respondents attributed higher importance to promoting their schools, and to targeted recruitment of students in particular (54%). Institutions used a broad range of marketing measures and communication channels to reach students. The survey asked respondents to break their methods into two categories – those used by degree (i.e., methods used to attract bachelor students, as opposed to masters students), and those used according to target group (i.e., foreign as opposed to domestic students). Providing information via university websites was the most commonly used method in both cases, followed by distribution of printed material, presentations at domestic student fairs/information events, entries in international portals/databases, distribution of information via existing networks/partnerships of the institution, and presentations at foreign student fairs/information events. In both categories, the use of agents in target countries was among the least-used methods. The final study published by the ACA is a detailed document running more than 130 pages. It contains important details concerning collection methodology, before offering a large assortment of respondent data, along with the interpretations and conclusions of the authors. This entry was posted in Czech Republic, Denmark, Europe, Finland, France, Germany, Greece, Higher Education, Italy, Language Learning, Most Popular, Netherlands, Poland, Regions, Research, Spain, Sweden, Switzerland, Turkey and tagged student recruitment, student mobility, colleges with international students, STEM degree, language learning.